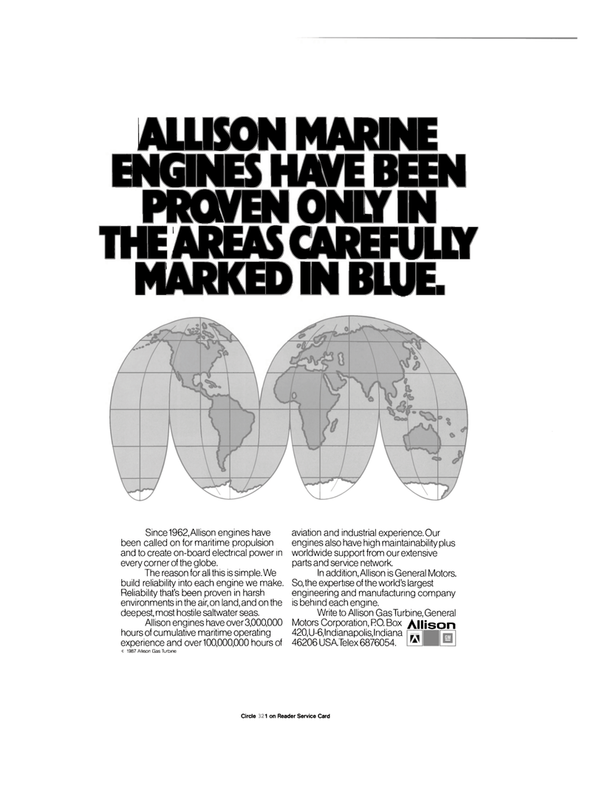 Since 1962,Allison engines have been called on for maritime propulsion and to create on-board electrical power in every corner of the globe. The reason for all this is simple. We build reliability into each engine we make. Reliability that's been proven in harsh environments in the air, on land, and on the deepest, most hostile saltwater seas. Allison engines have over 3,000,000 hours of cumulative maritime operating experience and over 100,000,000 hours of c 1987 Allison Gas Turbine aviation and industrial experience. Our engines also have high maintainability plus worldwide support from our extensive parts and service network. In addition, Allison is General Motors. So, the expertise of the world's largest engineering and manufacturing company is behind each engine. Motors Corporation, RO. Box 420, U-6, Indianapolis, Indiana 46206 USATelex 6876054.